What began as a blog becomes Ashes to Ashes: The Songs of David Bowie, 1976-2016, a tome for fans and critics. For those who have ever wondered if a blog can become a book, Chris O'Leary would respond with a hearty yes: his blog, Pushing Ahead of the Dame yielded two books. The current edition, Ashes to Ashes, begins in 1976, as David Bowie and Iggy Pop are planning to escape the dregs of life in Los Angeles and set up shop in Berlin. O'Leary adds a quick note to bring the reader up to date, had they missed his first volume, Rebel Rebel (Zero Books, 2015) covering Bowie's creative work from 1964 to 1976. Coming in at 575 pages, Rebel Rebel is just short of Ashes to Ashes' 710 pages. O'Leary adds that the endnotes for the book would have added so many additional pages that he and Repeater decided to publish the notes on a website rather than an appendix to the printed volume. Each essay addresses writing, recording, and production of the songs, along with discussion of how the songs fit into live performances. Read chronologically, Ashes to Ashes also creates a psychological profile of Bowie in the second half of his career, as glimpses of conversations and interviews offer insight into the songs. Reading through these essays, there were moments when I wondered if O'Leary found Bowie to be a likable person, and then wondering if Bowie was a kind person. My instinct, and my fandom, wants to appreciate his callousness and strangeness as part of his artistic genius, a claim which has decades of media coverage and fandom to support. In the introduction, O'Leary notes the awkwardness of writing about every single song, because among those were some that he found he did not care for at all. He has no obligation to try to be objective, nor does the reader. O'Leary covers more than Bowie's recorded music: the chapter "A Society of One" begins with the recording of 1980's Ashes to Ashes, including Bowie's #1 hit from the album, "Fashion". The chapter then segues into essays about the film Cat People and the recording of "Under Pressure" with Queen. Later, O'Leary covers "Absolute Beginners", the notoriously strange version of "Dancing in the Street" that Bowie performed with Mick Jagger, and the performance of "Do They Know It's Christmas" at Live Aid, all of which were released in 1985. The book lives up to the promise of including every song Bowie wrote, produced, sang, or played on, live or in studio. The size of the volume, and that it's the second of O'Leary's book, is testimony to the vastness of Bowie's career. Bowie's expediency in creating music remains a marvel throughout the essays: the quick spinning of words and rhythms in his brain yielded many tracks in a single take. O'Leary develops this thread in essays about the Heroes album, and the issue comes up again in the extensive discussion of Let's Dance. The evolution of the songs on what became Bowie's best-selling album is a fascinating story of rock history, literary and cultural references, and collaboration as O'Leary describes the interplay between Bowie, Nile Rodgers, and the musicians who performed on the album. Bowie, seeking to transform both his music and his persona, asked Nile Rodgers to produce Let's Dance, ending his long partnership with Tony Visconti. O'Leary notes that Visconti and the musicians Bowie had been playing with for so many years could predict his moves before he made them: to move forward, he needed new people with a fresh perspective. Always willing to reinvent himself, Bowie also rejected the label of bisexual that he had carried for years. Now, the Bowie of Let's Dance felt the label no longer suited him. But in choosing to discard that part of his identity, did he also discard the fans who embraced his earlier personae? Just the same, Bowie included a cover of "Criminal World", a song rich with bisexual overtones on Let's Dance, as if a wink to those fans who felt abandoned by the newly straight-declaring musician. Years later, after additional solo albums, recording with the band Tin Machine, and marrying model Iman Abdulmajid, Bowie reconnected with Tony Visconti for 2002's Heathen. Recording Heathen coincided with the September 11 attacks in America and O'Leary stitches the album into this piece of history. Bowie, by then, was a New Yorker and claimed the city as his home. In October, Bowie opened the Concert for New York in Madison Square Garden, sitting on the stage and quietly singing Simon and Garfunkel's "America". He played "Heroes" with his full band later in the show. As Bowie retreated from the spotlight for the next decade or so, O'Leary admits that he didn't sustain interest in the few smaller developments in his career. That changed with the 2013 release of The Next Day and its single, "Where Are We Now?" The revival was an exciting time for Bowie fandom and for O'Leary's blog, up to and including the release of Blackstar on Bowie's 69th birthday. Two days later, he died from the liver cancer he had been diagnosed with 18 months prior. O'Leary says that he was left speechless, uncertain what to say now that he had said so much about Bowie. Ashes to Ashes includes five essays about Blackstar that were not published on the blog but were written in order to complete the book. Commemorating Bowie's life and artistry continue three years after his death, with performances, blogs, and news stories about his career. The David Bowie Is exhibition, organized the Victoria & Albert Museum, London, was released as a digital app to celebrate Bowie's birthday. 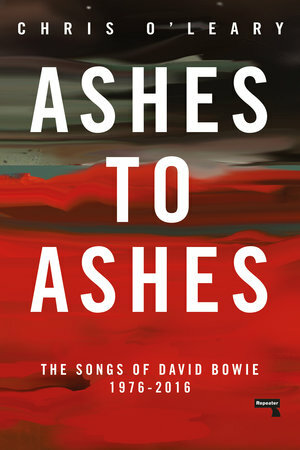 As this rediscovery and consideration of Bowie's cultural contributions goes on, Ashes to Ashes is a solid complement, both for fans who are learning more about the artist and for those who are recalling their favorite Bowie songs over the last 40 years.